I slice the earth with the blade of the shovel, digging carefully around the roots of the peony bush. For two years, the bush had not thrived. It had not bloomed well and had gotten powdery mildew on the leaves. It did not get enough sun in its current location. I placed the uprooted plant into the wheel barrel and pushed it around the house and to the front garden, which gets more consistent full sun. I transplanted it next to the arbor that guards the entrance to the vegetable garden. Now it has a spot to flourish. 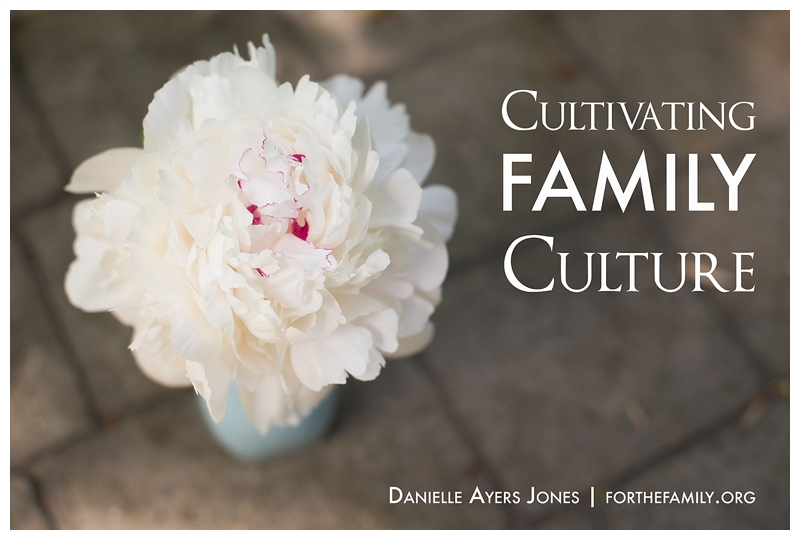 Cultivating family culture is a lot like gardening. It sometimes takes some transplanting, pruning, and watering to make your family culture really flourish. More simply put, family culture is the way your family lives life together. Are you the soccer family whose weekends are spent on the soccer field? Are you the hiking family who camps for vacations and hikes in national parks? Are you the family who reads books out loud to the kids every night? Is your family known for hospitality and having people over every weekend? Or is your family defined by serving the community and volunteer work? Your family culture already exists and probably flows out of your own passions and interests. But sometimes other people’s expectations of how we should orient our lives can bog down our family culture or we become discontent through comparison. To really flourish, we may need to prune extraneous activities or more intentionally pursue a different way of doing life. What values do I want to instill in my children? What skills do I want my children to learn? Does anything need to be “pruned” from our schedule? What memories do I want my kids to take away from their growing up years? How does our family have fun? How can we as a family serve those in need? By prayerfully thinking about what is important and planning how we spend our time we will help our family flourish. Relationships will have an opportunity to blossom just like my peony plant. Excellent, and very important to stress that family culture is intentional, because if the intention isn’t there, the family will acquire a de facto definition from popular culture,and mass media. Can’t think of anyone who’d want that, or benefit from it. I really appreciate the comments you made about other people’s expectations and comparison. Boy, do those two things trip me up often in all parts of my life but definitely in my mothering. I would love to have a dialogue on how to establish a family culture when husband and wife may not value the same things or even more difficult, value seemingly opposing things. Maybe this is a part of the journey God has me on–to try to figure some of that out for others to benefit. I’ll write that article in a couple years from now. Hopefully, we’ll have found some strategies. Yes, I think we all struggle to some degree with other people’s expectations and comparison. That’s why I love that quote from Sally!